Some years back, Dr. Gary Chapman, wrote a book called The Five Love Languages in which he proposed that we each have a distinct love language, or maybe two or three. These are things that others do for us in which we feel loved and cared for. Some of them on the list are: receiving small gifts, quality time spent with you, affection, etc. I’ve only read parts of the book, but have had lively discussions with friends about it and some fun thinking about my kids and what their love languages are. It’s helpful to focus on things that the recipient will really appreciate. Two Wednesdays ago, I went for my day of teaching at Redeemer School. One of the staff wished me Happy Birthday…to which I hesitantly replied, “But it’s not my birthday.” She said that I needed to go to the teacher’s lounge and look at the table of goodies. She was sure it was for me and my birthday. I was gobsmacked to find a paper wishing me a Happy Half-Birthday, a card, a wrapped present, and plates of unbelievably decorated cupcakes!! My secret pal (who is not a secret to me now:) had made these incredible cupcakes for me and the entire staff and faculty! 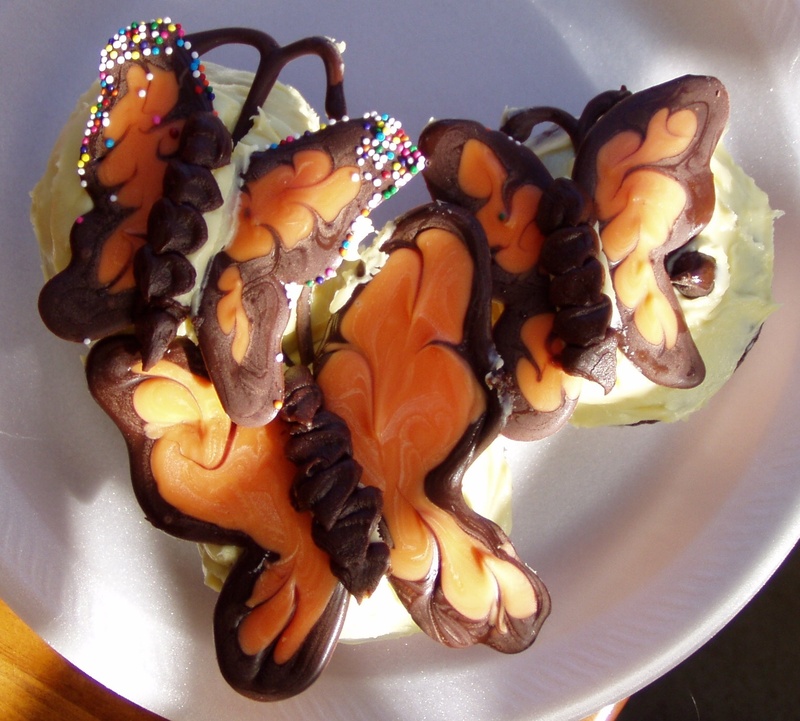 We all oohed and aahed, discussed how we thought she might have made them, and yummed our way slowly through our cupcakes. I was bowled over by the time, exquisite creativity, and care taken to make these for me on my “half-birthday”…a REAL surprise and treat!! Who knew indeed? I didn’t really even know this until he said it. But now it makes perfect sense: I ALWAYS feel loved and special when someone makes food or bakes for me! I’ve always felt that the best food in the world is food I have not had to prepare! I have never relished cooking. I DO cook. Or rather, I assemble food (you know… open a jar of this, a can of that, pour it all together and voila!) But I do NOT get my goodies from cooking. Nope. Never have. It feels like labor, work; even the whole deciding WHAT to cook is tedious and mind-numbing for me. I have catalogs of memories of dishes and baked goods that others have prepared for me. Beginning with the incredible dishes my mom made growing up: homemade spaghetti, oven baked bass in a scrumptious sauce, artichokes with butter sauce, homemade breads, granola, cookies of all kinds, and of course, my birthday cakes-red velvet, hummingbird cake, chocolate cake. Then there are the meals that good folks brought to us when each of our children were born…I can remember them exactly and many of them I have recipes for, but they never seem to taste as good when I make them. And then there are the meals we have enjoyed in people’s homes…oh my those are good times! In recent memory, there’s a birthday cake that a knitter friend made for me, complete with a lime green VW bug decorated on it (one day I WILL own one of those cars), and ALL the wonderful dishes my husband makes in the winter time. He actually loves to cook…but mostly in the winter months. You would think, that as much as I love food, I’d love to cook it. I don’t know why I don’t. Perhaps it has to do with the fact that when I cook, there are four differing and opposing opinions as to how good it is; or maybe that I’ve spent hours in the kitchen and once we sit down to the table, in less than 30 minutes, I have nothing to show for my efforts except a huge pile of dishes. I’ve TRIED to make myself like cooking with Pampered Chef gadgets and cool, new cookbooks. But to no avail. I am content to enjoy the fruits of other folks’ labors…their’s tastes better anyway AND I get to have more time for painting and knitting:). The Lord bless husbands who cook! How wonderful for these special gifts of love given to you . . . . blessings have a way of returning to all who have given to others. Wow, what a great day you had. I am like you; I do not care for cooking, but I do it all. We rarely go out to eat because of choice rather than anything else. So, when we do go out, it does feel like something special to not have to cook or decide what to cook. 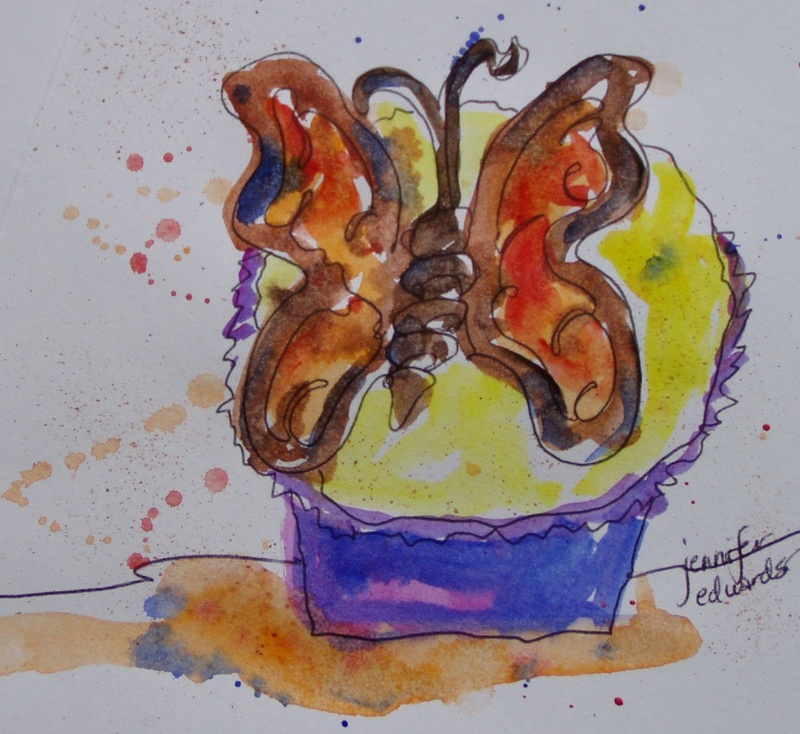 I love your painting of the cupcake. They were gorgeous and now you have a happy memory. What a great post and what a memorable day. Reminds me of my grandmother who said that whenever we sat down as a family (6 kids plus who all love food and cooking) we immediately talked about the next meal, memories of old ones, recipes, future meals etc etc. Alot of my happy memories revolve around food and family. Bliss. Guess that must be my love language too…? See, what’s so great about this is that each of us has things we DO love to do that we can share with others. Just like you share your blog with us. So wonderful. Thank you, Jennifer! Yes, a man who can cook is a wondrous thing! I value mine every day. I really like your cupcake painting. What a wonderful gift! Beautiful piece of art in itself! I love your sketch of it! Love, food and art. Sounds pretty good to me!